That's right... I'm giving up my nailpolish and my car and my AquaNet and I'm gonna SAVE THE PLANET!!!!!!!!!!!!! LOL, you didn't think I was serious, did you? Me, the Queen of Chemicals??? 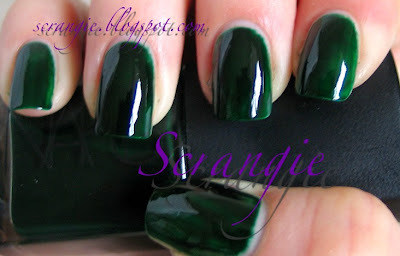 Well, one thing I *am* going to do is post pictures of green polish. 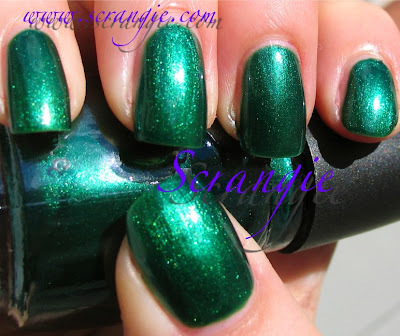 There are not enough green polishes in the world, but I've rounded up the greens from my collection and I'm going to post them here for all to admire. I will most likely have to do this in three or four installments, so consider this Part One! Thanks so much for the swatches. i don't do green but you gave me lemmings! I'm still drooling over SH Glow since the last time you posted it. It's beauuuutiful! Oh boy, I am already salivating for the olive green's I am sure you will show! Anonymous, oops sorry! :D You're very welcome! Greens are my all time favourites. Thank you for these swatches, although you make me want Sinful San Francisco and Sinful Show Me The Way even more than I thought possible! I think I just died a little bit! You know I love greens. I am so happy over the fact that Gussied up is coming to me, soon. It looks gorgeous on you! Greens are so vivid and beautiful! AAAAAAH I adore greens! Do you want to kill me or what?? LOL! J/k, love this post! Andie, oh no! Sorry if I've created a Zulu lemming! Sanna, you look awesome in green :D And lol, SCREW ZULU!!!! Sminkan, I don't know why more of these companies don't sell all over the world! It seems like more customers = more money, but maybe I'm wrong! Mom, yay, love you too! Tiffany, you may want to sign the Polish Addict's petition to bring back Zulu!! I hope they do bring back Zulu, it really is unique! I'm currently wearing Sinful's San Francisco and I've gotten so many compliments on it! Also, I'm sure I'm not the first to ask, but HOW do you get your polish so absolutely perfect? I always struggle to get mine nicely rounded near the cuticle like yours! I think i found a dupe for Nars Zulu, and it looks even closer if you add around 10 drops of black nail polish. Batchy, ooooh what is it? The brand is Tropical Manicure, and the polish is number 14. Without the black added it is a brighter green, but it a jelly, and if you add black it look so much like Zulu. This website has it, but the swatch is not accurate. Can you recommend a a bright apple green?